In this Osprey Aura AG 65 review, you will read about a great backpack which has received numerous design prizes in the past. It has been redesigned in 2018 so this is the fifth generation of the Atmos-Aura ventilated backpack series. 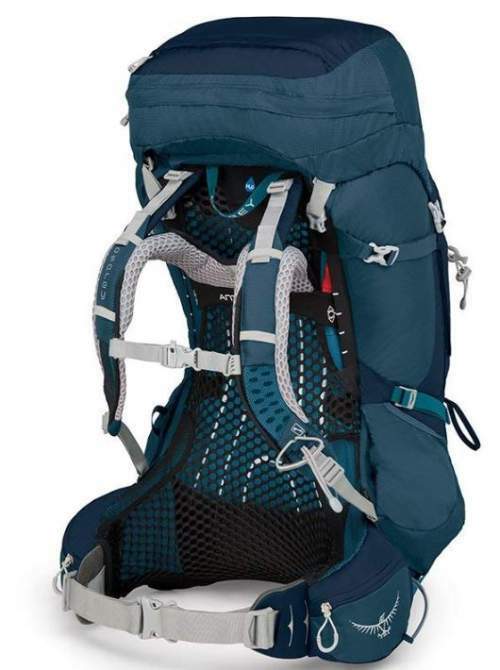 Osprey Packs Aura Ag 65 Backpack – version 2018. Flap Jacket feature for a leadless use. So this is a new 2018 version but there are no big changes here as I discussed in my previous text where I announced the arrival of the new series. This is still the same top-loading pack with the access underneath the lid and through the bottom compartment. The most visible difference is the inverted U-shape image on the front, as opposed to the O-shape image in the 2017 model. There seem to be some small variations in the mesh and padding, but this is nothing substantial. Prizes received for Aura and Atmos series. This is the best part of this complete series. The term Anti Gravity (AG) is used in describing this pack and it implies a continuous mesh which is in contact with the body on a large area so the weight is much better distributed and you avoid hot spots. The breathable tension mesh on the back is aimed at the best possible custom fit to your body. It continues as a seamless single peace throughout the back from the top, and to the lumbar area and around the hips which are typically the hot spots. So this is a unique system which incorporates the first ever fully ventilated hip belt. There are 3 sizes (XS, S, M) for this Aura AG 65 women pack (and similar is with the Atmos AG 65 backpacks for men where you have S, M, and L). But apart from that, the harness is also adjustable, it can slide up and down to fit your torso length. The range of adjustability in each size is around 4 inches. So this is a really great feature of this pack. This is not all. The hip belt is also adjustable. You can get extra 3 inches on each side of the hip belt to extend the padding out. This is what they call the Fit-on-the-Fly adjustability. Adjustable sternum strap comes with an emergency whistle. The contour and the shape of the pack is due to a lightweight internal aluminum frame that goes around the perimeter of the pack. One unique feature here are also the load lifter bars that are underneath the load lifter straps; they have introduced them to give some support and stability for the load that is above your shoulders. The top lid is floating, you have straps to lift it up in the case of more load, they are visible in the picture above. But it is also completely removable, and in this case, there is a Flap Jack which is permanently attached to the collar and you can use it to close the pack. The Flap Jack has its own buckles stored in tiny pockets and they match those that you have on the front of the pack and that are normally used with the lid. So this is a nice feature with some nice details, you have to appreciate it when you see how nicely they have done this. The pack has 9 pockets in total, see how they are distributed. You have dual zippered hip belt pockets, one on each side. One large zippered pocket and one smaller are on the top of the lid. The lower pocket is with two zipper pulls. Dual stretchy mesh pockets are on the sides of the pack; a water bottle can be placed there sideways or from the top entry. Two big zippered pockets are on the front, you have vertical zippers on the sides; these pockets are not available in the smaller pack in the series, the Aura AG 50. So these pockets are instead of classic side zippered pockets which I love to have in my packs, it is great to have them here. One big stretchy mesh pocket is on the front of the bag. Dual removable compression straps run over the bottom compartment, so here you can attach a sleeping pad or anything similar. 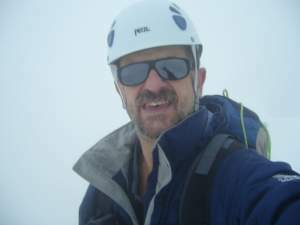 There are two loops in the same section for ice axes or for poles, and they are paired with bungee tie-offs higher on the pack. Note that both the bungee cords and the loops below have their tiny pockets where you can store them so that they do not catch branches when you walk through the bushes. The pack is with the Osprey’s famous Stow-on-the-Go attachment system for trekking poles. This is something you really need when you are on the move, to take a photo or to drink and eat, so you can store the poles without stopping and have your hands free. Dual compression straps are on the sides, the lower are V-shaped. You can cinch the pack when necessary or fix any object carried in the side pockets. There is also a top compression strap in the collar. Top quality materials and workmanship. Many small but useful details. *Note that the rain cover is available on the EU market. It comes stored in the top pocket on the lid and you even have a sign for the rain cover. But as far as I know, it is without the rain cover on the US market. – XS: 4.26 lb (1.93 kg). – S: 4.34 lb (1.97 kg). – M: 4.42 lb (2.01 kg). – XS: 3661 in³ (60 l). – S: 3783 in³ (62 l). – M: 3967 in³ (65 l). Dimensions M (H x W x D): 31 x 15 x 16 in (80 x 38 x 40 cm). Torso fit in inches (XS, S, M): 14 – 17 (35 – 43 cm); 16 – 19 (40 – 48 cm); 18 – 21 (48 – 53 cm). Waist/hips fit in inches (XS, S, M): 24 – 45; 24 – 45; 27 – 48. Here I give the Aura AG 65 side by side with two other top-notch backpacks from some other renown brands, all are women-specific packs. As you realize, the Maven 65 is without a match when it comes to the weight, and it is also full of features, including the adjustability of the hip belt and its pockets. The table contains only a few basic features, so please follow the links to see more. I hope this Osprey Aura AG 65 review was useful. This is one of the best packs on the market with so many useful details, with a great organization, 9 pockets, and with a full adjustability all over the pack. This all comes at a price, but this is a high-quality pack and a great value. I can fully recommend it. If the pack is too big for you, please check its smaller cousin the Aura AG 50. If you need a corresponding pack for men, check the Atmos AG 65 and Atmos AG 50. Please share your experience if you are familiar with this great pack, there is a comment box below. Thank you and have a nice day. Filed Under: Backpacks, Mountain climbing equipment Tagged With: osprey aura, osprey aura 65, osprey aura 65 ag, osprey aura ag 65, Osprey Packs Aura Ag 65 Backpack. Congratulations on your page. It is clear, and easy to read. 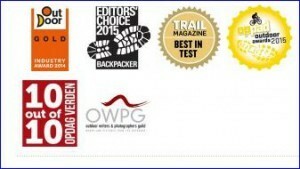 Your review of the Osprey Aura back-pack is thorough and detailed, and authoritative. I could find no typos or grammatical mistakes. I like the fact that you included a video, you have clearly done your research. I must say that I marvelled at the chap’s beard in the video – awesome! Thank you Josette, great to read your comment. I like this Osprey Aura AG 65 backpack, so I was motivated enough when I was writing this review. I really liked your review. It just seems perfect for my future hikes and backpacking trips!! Looks very comfy and I’m sure it’s perfect for the back. The YouTube video at the end is also very helpful and provides a lot more info. Hope to see more reviews from you. Hi Matt, great if it was helpful, that was the idea. Cheers.